On Saturday afternoon, Ken Thomas and Jon Gambrell at the Associated Press demonstrated the wire service's chronic resistance to recognizing genuinely good news during the Trump era. The pair pretended in their story about Donald Trump's Saturday conversation with Saudi King Salman that the President could only "claim" that Saudi Arabia has agreed to significantly boost its oil production in response to a tightening in worldwide supplies — even though as soon as Trump tweeted about it, the Saudi news agency confirmed its substance. I guess we should be thankful that the AP reporters didn't criticize Trump's typos. Not that he ever would have, given his hostility towards fossil fuel-based energy production, but if former President Barack Obama had arranged for an output increase as large as over 2 million barrels a day with other nations ("up to" 2 million announced Saturday, plus "up to" 1 million announced by OPEC a week ago, less overlap and production shortfalls) when oil was over $110 a barrel and gas prices were over $4 a gallon in 2011, the AP would have sung his praises to the hilt instead of providing uncalled-for doubt and feigned ignorance. For heaven's sake. 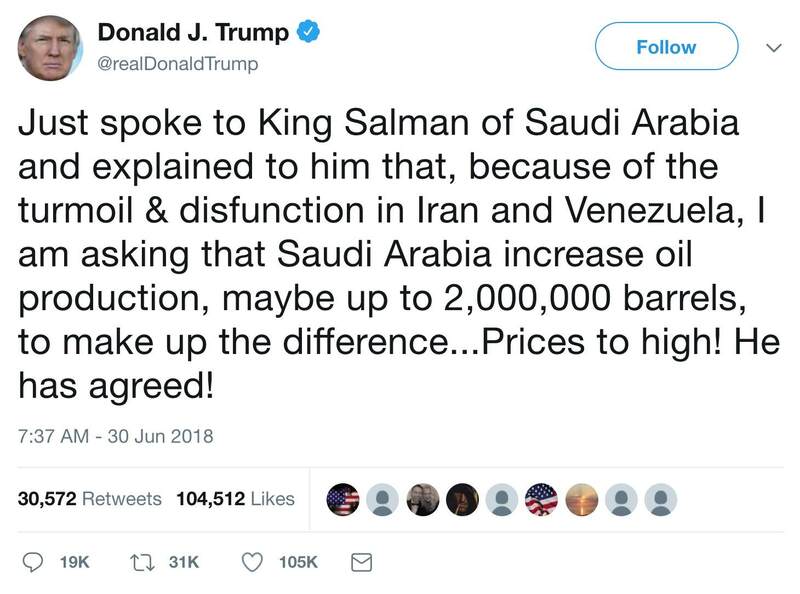 2 million barrels a day is a daily 20 percent increase which, per Bloomberg News — which had no problem recognizing that Trump meant 2 million per day — is just shy of the Saudis' 12.04 million barrel daily capacity. 2 million barrels per month, which the AP pair tried to pretend Trump may have meant, would be a 0.7 percent increase. The reporters know that a U.S. president wouldn't waste his or the Saudis' time talking about something so minuscule — which is why it's obvious that they were feigning ignorance in citing that possibility. 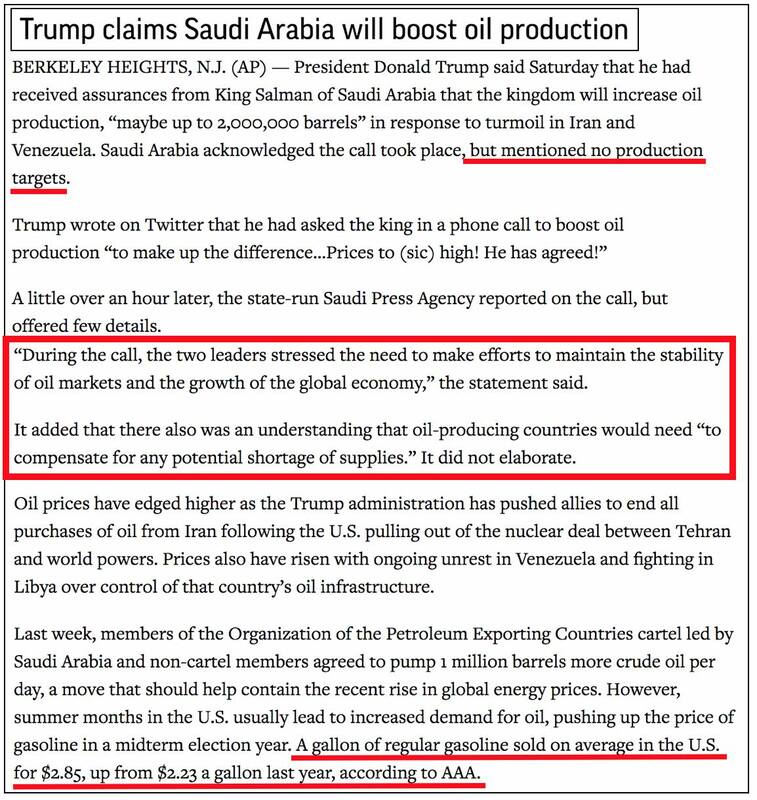 The first underlined item and the boxed text clearly indicate that the Saudis were really saying, "We'll do whatever it takes." As to the fretting about gas prices, the two reporters have conveniently forgotten the $4-plus and near-$4 peaks seen in the gallon gas price in 2011 and 2012, and the fact that prices stayed above $3 between early 2011 and late 2014. They also have forgotten that high gas prices, despite Obama's contrary claims, are "what the administration want(ed)." During the 2012 Republican primaries, the press ridiculed GOP presidential candidates like Newt Gingrich who said that gas prices could be brought down to $2.50 or lower. Finally, the AP reporters and most of the rest of the press have consistently ignored the fact that the current oil price and supply situations would be far worse if it weren't for the fact that U.S. oil production has increased by over 2.1 million barrels per day (from 8.766 million in December 2016 to 10.900 million during the week of June 22), or 24 percent, since the end of 2016.